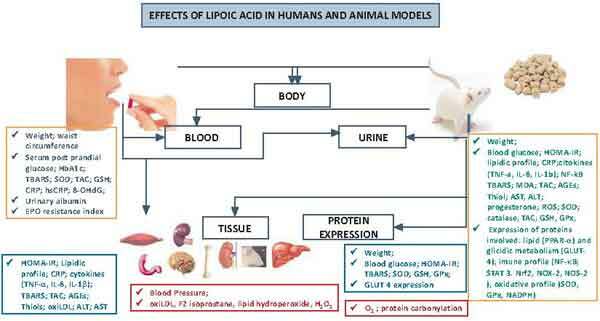 Lipoic acid (LA) is an antioxidant able to produce its effects in aqueous or lipophilic environments. Lipoate is the conjugate base of lipoic acid, and the most prevalent form of LA under physiological conditions. It presents a highly negative reduction potential, increases the expression of antioxidant enzymes and participates in the recycling of vitamins C and E. Due to these properties, LA is called the "universal antioxidant". LA is also involved with anti-inflammatory action, independently of its antioxidant activity. This review was carried out, aiming to identify, analyze, and rationalize the various clinical, physiopathological and/or physiological situations in which LA, through oral supplementation, was tested on human and animal (rats and mice) models. LA was mainly tested in cardiovascular diseases (CVD), obesity, pain, inflammatory diseases and aging. LA uses in CVD and obesity, in humans, are controversial. On the other hand, beneficial effects on inflammation and pain were observed. LA supplementation in animal models may prolong life, has neuroprotective effects and presents positive effects against cancer. Differences observed in human and animal models can be due, in part, to different treatments (LA combined with other antioxidants, different doses) and to the variety of biomarkers investigated in animal experiments. These results suggest the need for further clinical trials to guide health professionals regarding the safety of prescription of this supplement. Inflammation, Lipoic acid, Oral supplementation, Oxidative stress. Instituto de Quimica e Biotecnologia (IQB), Universidade Federal de Alagoas (UFAL), Campus A. C. Simões, Avenida Lourival Melo Mota, s/n, Tabuleiro dos Martins, 57072- 970 Maceio, AL, Brazil.